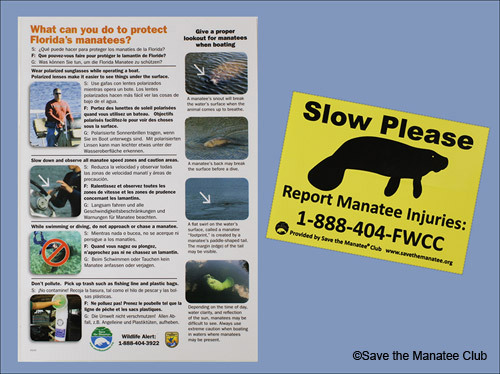 Save the Manatee Club’s waterproof waterway card with manatee protection tips and the boat decal with a number for reporting injured manatees. Note: High resolution images of manatees as well as Save the Manatee Club’s free boat decal and waterway card are available upon request. As Florida’s boating community gears up for the July 4th holiday weekend. Save the Manatee Club urges resident and visitors to keep manatees in mind during the holiday and every day while enjoying the state’s waterways. The Club has a free Boating Safety Packet that provides tips to protect manatees as well as information on regulatory signs and a number for reporting an injured manatee. Manatees are found in shallow, slow-moving rivers, bays, estuaries, and coastal water ecosystems of the southeastern United States. They can live in fresh, brackish, or salt water. They prefer waters that are about 3 – 7 feet deep. Along the coast, they tend to travel in water that is about 10 – 16 feet deep. Manatees are herbivores, feeding on a large variety of submerged, emergent, and floating plants. They are slow-moving, and usually only swim about 3 – 5 miles per hour. Because they are mammals, they need to surface to breathe air. All of these factors make them vulnerable to boat strikes. Watercraft-related manatee mortality is the leading identified cause of manatee death in Florida. Manatees can suffer injury and death due to the crushing impact of the hull and/or the slashing of the propellers. Last year in 2016, a record 105 manatees were killed by watercraft in Florida, and many more manatees suffered non-fatal injuries from boat strikes. The Club offers a number of free public awareness materials to help boaters protect manatees from watercraft collisions. One of these items is a Boating Safety Packet, which contains a weatherproof boat decal with a hotline number for reporting manatee injuries, deaths, or harassment. It also includes a waterproof waterway card that was created in conjunction with the Florida Fish and Wildlife Conservation Commission (FWC) and U.S. Fish and Wildlife Service. Laminated with a hole in the corner so it can be easily hung and kept on board a vessel, the waterway card features four simple tips to help protect manatees. Because manatees may be difficult to see, photos are provided that show what a manatee’s snout or back looks like when it breaks the surface of the water as well as a photo of a flat swirl on the water’s surface, called a “manatee footprint,” that is created when the manatee swims. The flip side of the card includes examples of regulatory signs posted for manatee protection, along with a description and a demonstration photo of a vessel operating at the speed for each zone. Information on the card is provided in English, French, Spanish, and German, so it is suited for Florida’s many visitors. Other items that Save the Manatee Club provides free of charge include waterproof banners for boaters and public awareness signs for Florida shoreline property owners. The bright yellow banners read “Please Slow: Manatees Below,” and can be used to warn other boaters if a manatee is spotted while out on a waterway. In addition, free aluminum dock signs with a similar message are available for Florida shoreline property owners. To get the free Boating Safety Packet, waterproof banner, or waterway sign, please send an email to Save the Manatee Club at education@savethemanatee.org or call toll free 1-800-432-JOIN (5646). Send your mailing address to get the free boating safety packet and waterproof banner. To receive the free waterway sign, please send the address where the sign will be posted and the mailing address, if different. More Manatee Protection Tips for Boaters can be found on the Club’s website at savethemanatee.org/boatertips. You can also view the Club’s new “Safe Boating Tips to Protect Manatees” video.